Sometimes, it seems like change comes at you so hard and fast that the passage of events becomes but a blur. On the other hand, it also seems that the more things change, the more they stay the same. If you’re not green and growing, you’re ripe and rotting, but sometimes it’s difficult to feel the life inside, buried deep within the heartwood. Have you ever pruned a branch that you were sure was long dead, only to find green signs of life under the rough exterior? And you wished that you had given that particular branch a little closer inspection? And how long should a negative cycle last? How long should we just “hang on”? “As long as you have to; hope never fails if you wait”. And when the “valley” experiences pass, as they always do, why do we spend so much energy while on the mountaintop fretting about the next valley? I think that this is nowhere more evident than in learning to play music, as the process is very much akin to a personal relationship. A budding musician goes through the initial phase where every note, every chord is a revelation, and they just can’t seem to “get enough”. I remember mom actually buying me a rocking chair to put out on the front porch just to get me out of the house; I played ALL the time, and loudly. I was not good, but I thought I was. Then as I progressed, I began to improve, but soon hit a plateau where no improvement was apparent as it was so incremental. I began to do the worst thing a musician or writer can do, comparing myself with others, and Discouragement moved in along with his deadbeat cousin, Reality. Then other interests crept in as well, and before you know it, that phase of my life had passed; not necessarily the love, but definitely the infatuation. But I knew it was always there, somewhere deep under the surface, waiting to be re-awakened. 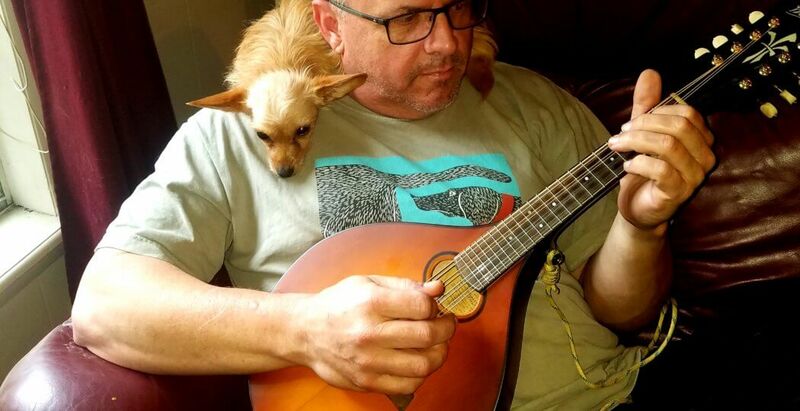 When I found the new/old mandolin on the recent trip to Ola to meet Claire the foster dog, it was like finding my first banjo twenty-five years ago; priced WAY beyond one of my rank beginner status, but it didn’t matter then, and it didn’t matter now; this was the one. It has prompted a spark that has grown into a flame. Do I have any delusions of granduer, maybe hitting the stage at the Grand Ole Opry with Marty Stuart? Not on your life; this one’s all for me. Just kidding about Marty Stuart; I would be there in a second, even if it was just to have the honor of tuning his guitar. Mom put out the first hummingbird feeder a couple of weeks ago, and we have been waiting for the first of the feathered welfare recipients to arrive. There had been no sign of the little ingrates until yesterday, when I took the mandolin out on the back porch to make a little racket, and lo and behold, a solo hummingbird appeared. No doubt a scout sent in advance of the hordes poised to the north to descend on the Casa del Whackos. Call it a sign if you want, I just take it for what it is, a pretty dang cool thing to happen. So if you’re on a seemingly endless plateau, don’t walk off of the edge; stay there until that new instrument, that new project, that new direction even, is shown to you. For good or not so good, this too shall pass.